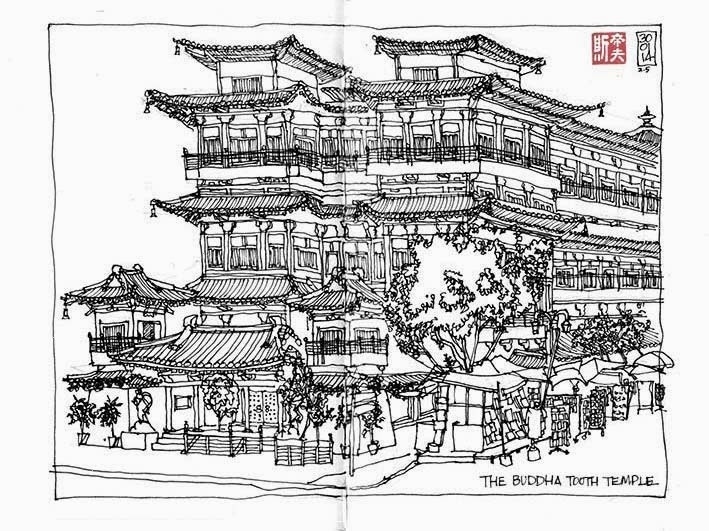 Following a recommendation from a gentleman last weekend, I settled down to sketch the ornate joss tick burner in the Thian Hock Keng temple on Telok Ayer Street. With only a few preparatory lines on the page, I was informed that the temple was closing early to prepare for the New Year celebrations. I packed up and mumbled my way back to the heart of Chinatown where I discovered Eric's Wuerstelstand (see below). With a meatloaf sandwich and beer on board, I found a suitably shady spot to sketch the Buddha Tooth Temple. Much scribbling later, a chap from Malaysia who stopped to chat said he’d noticed me when he passed two hours ago - I had no idea I had been there so long. He rummaged around in a flimsy bag to offer me an apple which I accepted with much thanks. I have only been sketching for a few weeks, but the people I meet are so incredibly friendly. I still don’t understand why people want to take photos of me or my sketch book. Half an hour later, I noticed that some parts of my body were getting a little crispy from the sun as I was no longer in the shade. I think some sort of hat might be called for in the future. I've been wondering for a while now, what does the red square on your sketches say? It means Steve 斯蒂夫 (sī dì fu). I’ve also seen it written as 史蒂夫 (shǐ dì fu) which has a different first character and a slightly different pronunciation.